These knives made by the famous Swiss cutlery manufacturer are made from the highest quality materials. 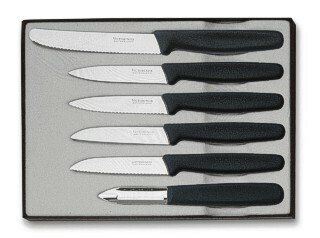 Lightweight and razor sharp these knives will give you many years of continuous use. The set consists of potato peeler, round tipped tomato knife, straight and pointed parers in both standard and serrated edges and the six knives are presented in a gift box.